I'd like to buy the band a drink. I should qualify that a little bit. This particular party was different in some meaningful ways. For one, this was a live radio broadcast attended by a small audience of Live Lunch members and first-come-first-servers that included small, impressionable children and older, more refined looking NPR types. That meant that the requisite amount of bawdy stories, audience heckling, and creative swearing had to be kept to a bare minimum. The second significant difference between this warm-up show (Love Jones played the NuLu Festival on October 2) and the LL broadcast was that this was a 12-noon show at a radio station studio. That meant bright lights, a measure of decorum for band and audience, and (mother-of-gawd) no booze on evidence. A wealth of the last and a dearth of the others have always been critical for optimal enjoyment of Love Jone’s hybrid of AM 50’s/60’s/70’s gold and crooning cocktail pop. Other than these jarring distractions, the LJ party resumes where it left off with 1995’s Powerful Pain Relief. Lack of libations notwithstanding, the boys still know how to work their irreverent charm onstage, lobbing hilarious barbs at one another, their beloved city of origin, and anyone else who happens to cross their line of sight. Their live personae prove so crucial to “getting” the band and enjoying their lyrical mixture of bold come-ons and adorable insecurities, and it’s unfortunate that this just does not transfer to any distribution format. Just as importantly, the new music holds up to scrutiny, too. The Live Lunch set consisted of some tracks from older releases (“Fragile,” “Paid for Loving,” Pineapple”) and live favorites, but most of the set list came from newly released long-player Forever. These songs (“Charm City,” “Players School”) would have sounded right at home on either Here’s to the Losers or Powerful Pain Relief, so there’s no Love lost from my perspective. Chris Hawpe’s clean falsetto vocals and crisp guitar work have lost nothing with added mileage (standout “Bittersweet”); Ben’s drum skills and frontman wit remain sharp; Barry Thomas (Barry! Barry!) holds chaos in check with his fluid yet punctuating bass; the harmonies hit more often than they miss for a band that claims not to rehearse; and the group knows how to cherry-pick nimble side-players. No matter when you or where you see them, a blistering lead guitarist is always present. They don’t get back to their home town often enough, but if you can catch them, it’s highly recommended that you do. Even in the adverse circumstances of performing outside of a swinging, sotted club, Love Jones still brings the party, and that is in no way depressing. Here’s to the good times that never end. Charm City JSO: “It’s me, Love Jones.” Priceless. Pineapple JSO: Apparently, “smoke some dope, y’all, yeah!” has become standardized to five repetitions, but I saw it grow from the one original reading to three, now to five. Lucky me. P.S. 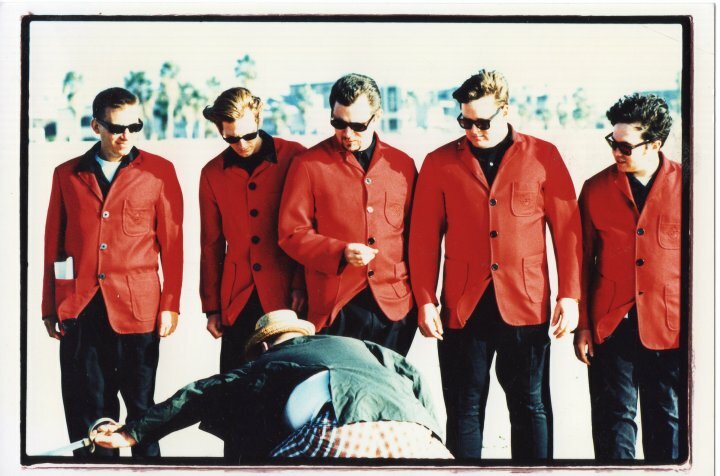 In addition to the band’s ball- and gut-bustingly hilarious onstage antics and their fine booty-quaking music–not to mention our collective liquor intake (it takes a village to get this funky)–sartorial choices also form a highlight of every live show…except for, say, a radio broadcast. After having caught them bedecked in Caddy Shack-inspired golfing attire and disguised as the Bob Seger Silver Mullet Band, I am supremely envious of those who were able to catch the NuLu show, as this lucky lot was treated to an entirely new visual venture: Sweatsedo Track suits sponsored by Dumante’ Liqueur. So where the frak can I get this new album? Went to the label’s website. No luck. Went to a couple online music purveyors. No luck. Is it digital only? Vinyl? Help me, I have the stupids. Patrick — If you check their facebook page they are selling some cd’s as well as of this week. I ordered one of those from them — basically just send them an email and $11 bucks on paypal and they will mail you the cd. An exquisite write-up, Herr St.Orts. Viel Danke, Paul. Check out the updated version, now featuring links and marginal copy editing!